This is neat. 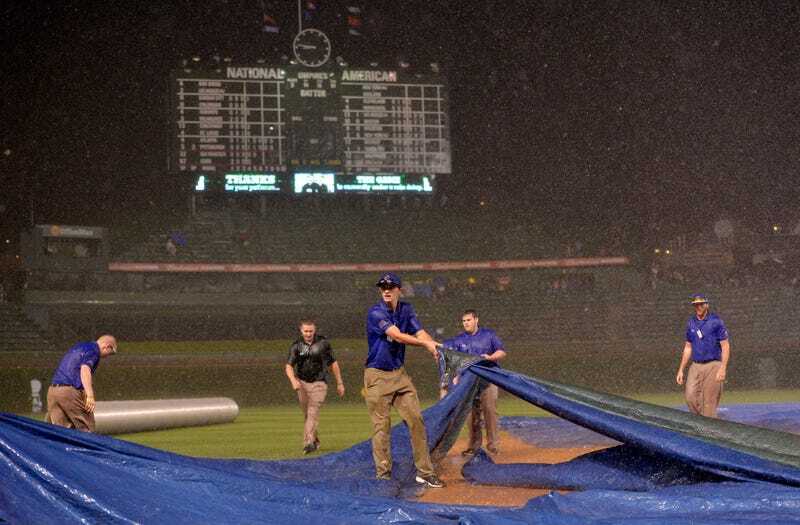 Thanks to the tarp shenanigans at Wrigley Field Tuesday night, the Giants-Cubs game was called after a four-hour and 34-minute delay. With four-and-a-half innings in the books and the field an unplayable mess, crew chief Hunter Wendelstedt called the game, and awarded the Cubs a 2-0 win. The Giants, in the middle of a pennant race, successfully protested the ruling and the game will be resumed Thursday at 4:05 p.m. It's the first successful protest in major league baseball in 28 years. The Giants argued, and Joe Torre agreed, that the tarp failure was a mechanical one. Specifically, the Cubs ground crew failed to properly wrap the tarp up the last time it was used and this jammed everyone up when they tried to unfurl it Tuesday night. The Giants argued alternatively that grounds existed for a forfeit in their favor, but MLB denied that portion of the protest. It's not incredibly rare for teams to protest a game but, until today, the process has largely been academic. You have to go all the way back to 1986 when a protest was last upheld. On June 16 of that year, the Cardinals beat the Pirates 4-1 in a rain-shortened game. After two delays of 17 and 22 minutes (with only two pitches thrown in between), chief umpire John Kibler called the game with one out in the top of the sixth inning. National League president Charles Feeney ruled this was improper as NL rules required umpires to wait 75 minutes during an initial delay and 45 minutes during a subsequent delay before calling the game. Like today's ruling, the teams were ordered to resume the game. Hopefully things turns out better for the Giants, the Pirates still lost 4-2 when the game was completed two days later.